My relationship with fitness has evolved over the last 20 years. I was never an athletic kid and I was always the last one to get picked for team sports. As a teenager, I took up smoking and sustained myself on a diet of white bread, processed cheese, and French fries. The pounds continued to cumulate. But in my 20’s, after feeling disappointed in myself long enough, I started doing aerobics classes just to “try it out”. 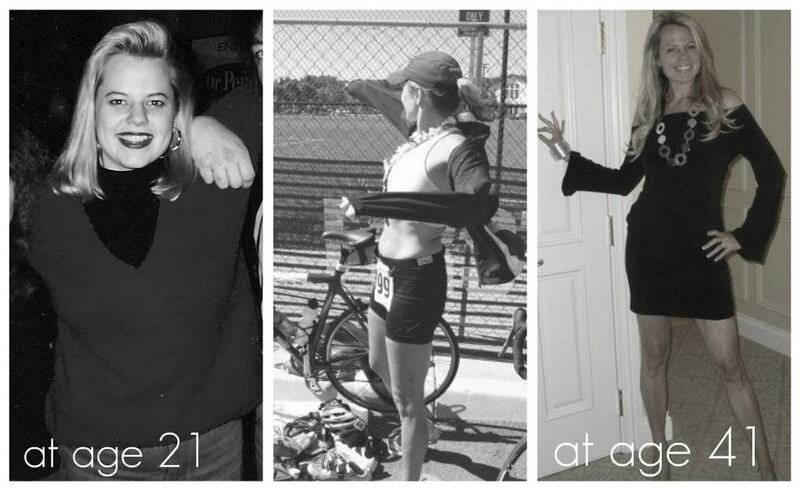 I didn’t love it at first, but kept at it and eventually took up running in my 30’s. This momentum inspired me to give up smoking, and at the age of 37, I bought a road bike and signed up for a half-Ironman (first time on a bike since I was 10!). When I hit my 40’s however, things started to change. My running routine didn’t serve me the way it once did. I was flabby, jiggly and skinny-fat. After a 3 week trip to Italy with my husband where I ate pizza and drank wine from Venice to Rome, I was at a point where I knew something had to change, but I didn’t quite know what that was yet. I was feeling lost and frustrated. While getting my hair done one day, I asked my hairdresser (a part-time fitness model) how she stayed in great shape. She told me that it was more about nutrition than constant cardio and that mindset was key (it always is). She said I just needed to make a decision to get fit and DO IT. At that moment, I was watching a P90x infomercial on the TV and something just kinda clicked. Sounds like a total cliche, right? I know, but so it is. Anyway, I ended up buying P90x and things just changed from there. I got in the habit of working out 6 days a week and lifting weights. That was a big jump from my former 3-day-a-week running routine. My body started to change, I was less hungry because I wasn’t only doing cardio, and I started to develop a new sense of confidence. It’s as though the strength I was developing physically was building a mental confidence muscle as well. To make a very long story short, my experience with P90x took me to the stage to compete in a fitness competition. I did hire a coach to help me with the competition, but it was that little set of DVD’s that got me 80% there. After that show, I ended up becoming a personal trainer and nutrition coach and launched a healthy food company as well. That’s how one small decision to buy a set of DVDs changed my life. Today I no longer own the food business (it bumped along for 2 years, but I couldn’t scale it for growth), but I’m still in the fitness industry. Today I coach women in online group challenges. They get a comprehensive workout program, superfood nutrition packs, a food plan and a timeline of what to do when. There is zero guesswork with this package. I layer the motivation and accountability on top of the program – pushing challengers to keep at it when the going gets tough (because it can and does get tough). This is also how I continue to keep myself fit! I do the workouts and meal plans right along with my challengers. I have to walk the talk land I do it every day. I find that having that accountability is so important because life gets busy and it’s real easy to talk yourself out of a workout or take side cuts on my nutrition. I have to be the shining example for my challengers and that keeps me honest!!! I love what I do now. It’s not personal training (i.e. count your reps and sets in a gym), but it’s being the one in the court for the women I serve. I’m in my 40s now and I KNOW how busy life can be with career and family. As women, we’re all about doing things for others, but we’re really good at putting ourselves last. It’s my job to make sure that doesn’t happen during our coaching experience. If you’re interested in being a part of one of my challenge groups, drop me a note. I’d love to have you be a part of the experience. If being a motivator is something that appeals to you, you may want to explore working with me as an accountability coach, too. It all starts with a challenge. YOUR challenge to yourself. You don’t have to do it alone, but you do have to commit. 100% all in.